SOUTHAMPTON, N.Y. – Resting up at his rental home a few miles from Shinnecock Hills, with his afternoon tee time still hours away, Graeme McDowell faced a dilemma. As a U.S. Open champion, he is plenty familiar with the rigors and demands of a USGA setup. But even he had heard whispers of the carnage sweeping across eastern Long Island in the early morning hours Thursday, and he had to decide whether or not to turn on the television to watch it. “Part of me was thinking, like, is it better to get punched in the face by surprise, or is it actually better to be prepared to be punched in the face?” McDowell said. He opted to prepare. It didn’t help. After the leaderboards at Erin Hills were coated with red numbers a year ago, the U.S. Open returned to its bludgeoning roots Thursday thanks to an assist from Mother Nature, leaving destruction in its wake and nearly no player unscathed. With steady winds buffeting the sprawling layout, an already taxing course was pushed to the extremes. Despite doing some early homework, McDowell signed for a 79 after he and fellow past champions Webb Simpson and Lucas Glover played their first 13 holes without making a single birdie. But that still left him ahead of the 29 players who failed to break 80, a group that included major winners Rory McIlroy (80), Keegan Bradley (81) and Martin Kaymer (83). Despite world No. 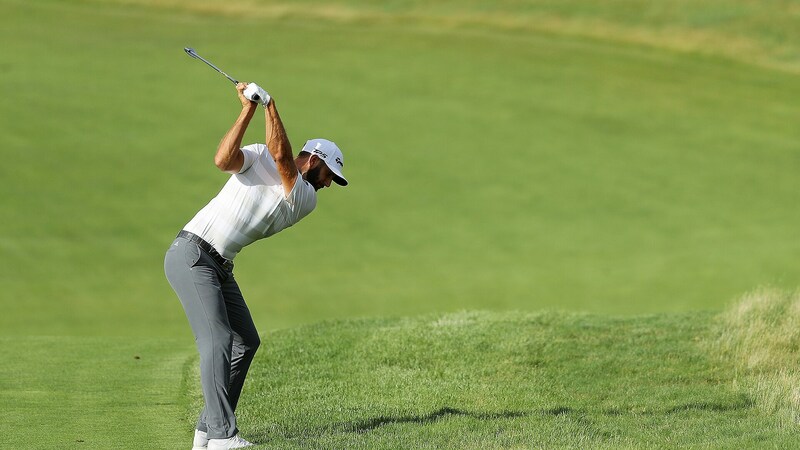 1 Dustin Johnson sharing the lead after a 1-under 69, the top 10 players in the current world ranking combined to shoot 52 over par. The average score for the field on the par-70 layout was a stout 76.5. A pleasant stroll through the park, this was not. “I don’t feel like I hit it that bad, and I mean, I shot an 80,” said Scott Stallings. Stallings went out in the first group, bright and early at 6:45 a.m., and his troubles on the 14th hole were one of the first indications that players were in for more than the typical demands of a U.S. Open test. Facing a lengthy par putt, he could only watch as a stiff downwind breeze carried his ball from a few feet beyond the hole to clear off the green. When he was done bouncing back and forth across the putting surface, he tapped in for a quintuple-bogey 9. His playing partner, Sebastian Munoz, managed a respectable double after following Stallings off the green from mid-range with putter in hand. Unlike the debacle of 14 years ago, blame for these eye-popping numbers wasn’t laid at the feet of a flawed course setup. USGA CEO Mike Davis spoke openly Wednesday about his group’s efforts to adjust their plans in the face of the harshest winds expected all week, and players by and large found the setup to be fair. But fair didn’t mean easy, or close to it. Whatever razor-thin margin for error exists around Shinnecock for a typical round was quickly eroded by a rare westerly wind, one that most players hadn’t faced in early-week practice sessions. Taking a break from his day job as an NHL referee, amateur Garrett Rank surveyed a delicate chip shot on the very first hole of his U.S. Open debut and knew that he was in trouble. Perched just left of the 10th green, Rank surmised that his 30-yard pitch would respond differently than any he had encountered during his preparation. So he adjusted accordingly, hitting the ball only half the distance he expected it would need to reach the hole. He hit the shot he planned, and watched it bound up to the hole. Then a little past. Then a few feet farther, and about 10 feet beyond the hole his ball caught a slope and headed toward Montauk. By the time it came to rest, Rank was staring down a 30-yard chip from the other side of the green. Indeed, there was no easing into the 118th U.S. Open, where several big names are likely looking into Friday night flight plans. Jason Day joined McDowell at 9 over, while Tiger Woods, Jon Rahm, Adam Scott and Jordan Spieth were among the decorated group at 8-over 78, each humbled at different times throughout the day and now trailing exactly 100 players after only a single round. “There were a couple of (pin positions) that were a little dicey, but all in all it was more just very difficult to control the ball off the tee, getting it where you wanted to in this wind,” Spieth said. After watching Spieth, McIlroy and Phil Mickelson hack it around and subsequently failing to do much better, McDowell stood by his decision to prepare via broadcast this morning as a wry grin crept across his face. With plenty of experience and a U.S. Open title under his belt, he eventually came to the same realization as the players he watched mid-struggle: on this day, in these conditions, there was no ducking the punches at Shinnecock.